Your containers may be ordered in your choice of company color or fully hot dipped galvanized. 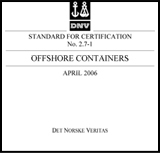 The "DNV Certification Note 2.7-1 Offshore Freight Containers" was published by Det Norske Veritas in 1989 because no other regulations specifically addressed offshore containers. The standard sets minimum criteria for design, material, production and testing for containers that are to be used in offshore applications. The international standards, codes and regulations that were relevant were taken into account when preparing this standard. The most important were the International Maritime Organization's circular MSC/Circ. 860 and the European Standard EN 12079. Thus, containers certified to DNV 2.7-1 also comply with these two standards. DNV 2.7-1 applies to all offshore units that are shaped like a container and have a MGW of 25,000 kg or less. It was revised in 1995, 2006 and 2013. The June 2013 version supersedes all previous versions. All containers built after September 2013 should be certified to this version. Most containers built to the 2006 version will also comply with the 2013 version and recertification is not necessary. You may view the full published standard by clicking on the icon to the left. What makes a DNV 2.7-1 Certified Offshore container different? DNV 2.7-1 certified offshore containers are specifically designed for dynamic lifting via padeyes and a DNV certified lifting sling equipped with shackles. They are inspected at the design stage, material procurement, production and final load & NDE tested. Not only is a prototype tested but a specified number of randomly selected units from each batch are tested at a rate that is 5 times the testing rate for typical ISO shipping containers. These containers have solid steel construction, including the flooring. They weigh nearly twice the comparably sized ISO container which is critical in their ability to maintain their upright position during transit through rough seas. They are required to have a uniquely identified DNV certified lifting sling, significantly stronger steel, more stringent production compliance and to have all the testing documentation to prove their worthiness for the rigors of offshore conditions. Copyright 2009 - 2014 DNV271 Containers a division of Shipper Owned Container . All Rights Reserved.